"It's like having a clown inside your head." How does one explain Mr. Show? Well see, there's these two guys, Bob Odenkirk and David Cross, and they have a sketch comedy show. There's a mad scientist trying to blow up Earth, and a pair of conjoined twins who aren't really conjoined and then they get re-attached, but then there's a schoolteacher who goes up his mom's—never mind. Make sense? If it doesn't, that's OK, because like any great sketch comedy show, Mr. Show isn't interested in being sensible or realistic; it just wants to have fun. The brainchild of comedians Bob Odenkirk and David Cross (both of whom had shared time together on the short-lived-but-brilliant Ben Stiller Show), the program basically cuts loose for a half hour and doesn't stop until everything is over. Satirizing television, the news, the government, and just about anything else, the show manages to take many aspects of the average sketch comedy zone and change the rules enough to be very, very funny. Backed up by an extremely talented cast and group of writers (which also includes some great comedians who, at the time, were breaking into the mainstream), Mr. Show is arguably one of the best television sketch shows since Monty Python, although it's short life span and weird time slots when it originally aired have kept it relatively obscure. The third season contains the usual great stuff, but also includes some of Mr. Show's most popular material; stuff that will be remembered for a long time to come. Who could forget the fantastic "Altered States of Druggachusettes" sketch, which perfectly satires the old Sid & Marty Krofft children's shows, or the fake advertising campaign for "Mustmayostardayonnaise." There's the re-appearance of Ronnie Dobbs in the "Fuzz" musical, and even a visit from the Mayor of Television! All in all, the true hilarity of the show, at least for me, is the "average guy" sort of quality that both Bob and David share. I dare say that their style of humor, though sometimes crude, is brilliant because of this. It seems to stem from a very funny, natural observation of the world around us. Of course, that analysis might just be a pointless exercise; do we really need to examine Mr. Show like that? I think not. What we can do is watch and learn about one of the greatest comedy shows on television that almost no one saw. While Mr. Show will briefly be revived for a few seconds in the form of the Mr. Show movie, Run Ronnie Run, which is now being released straight to video, the comedy duo doesn't really approve of that little creation (or what New Line Pictures did to it), so perhaps it's best to just stick with what works, and this show definitely works. Image Transfer Review: There are really no issues here, the transfer looks very clean and smooth and replicates the live image of the show very well. The filmed segments look good (despite some artifacts here and there), but since most of the show is live, you get the general idea after a few minutes of what kind of lighting and photography you're going to be dealing with. Audio Transfer Review: The audio retains the Dolby Surround information of the original broadcast, only the rear channels have been mixed down a bit (the audience was extremely loud in the original television broadcasts). You still get the feel for the audience and the entire performance, but with lower volume in the rear, the comedy is able to take center stage much better. Overall, you're looking at a mainly dialogue program, so that's the key issue here, and there are no problems at all with the presentation. Every now and then a sketch is hard to hear or understand because of enormous audience laughter, but that was there to begin with. Isolated score from the "Druggachusettes" sketch. Extras Review: Things are kicked off with a great episode-by-episode commentary featuring Bob, David, Tom Kenny, Jill Talley, Jay Johnston, Paul F. Tompkins, Bill Odenkirk, Brian Posehn, and many others. For most of the episodes, all of these participants are actually together in a single session, but the commentary is recorded well and everyone is fairly easy to understand when they're not talking over each other. It's filled with humorous observations on the making of the skits, how the ideas came up, who wrote them, which ones got shelved, etc., and it's all in very good fun. Unfortunately, the sound mixing could have been a touch better as sometimes the actual show audio will crank up to full volume between someone's pauses and it gets annoying. The funny thing that people have to remember is that cast member Tom Kenny also does zillions of cartoon voices, among them the beloved Spongebob Squarepants. The rest of the features are similar to those found on the first Mr. Show DVD (which covered the first two seasons), with slight differences. There's a 30-minute "best of" episode entitled Fantastic Newness that features new material and performances by the Mr. Show gang, only the highlight is flashbacks of previous episodes. Exactly where this episode came from and when it aired, however, is a complete mystery. 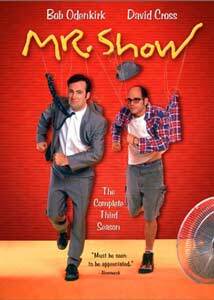 I watched Mr. Show religiously during it's original four-season run and never remember this show airing (whenever HBO wanted to re-introduce the show, they'd just do a marathon). If you've never seen the first two seasons, this is a good compilation of them. The complete set of original HBO promos for the show are also on the disc, which is nice for completists, as well as the promos Bob and David made while attending the 1997 Comedy Arts festival in Aspen, Colorado. There's also footage of them performing at the festival; an excerpt taken from one of HBO's original specials covering the event. The strangest feature is a presentation of the "Druggachusettes" sketch with ONLY the musical score, which was done by Eban Schletter. It's an interesting look at the weird, trippy score created for the piece, but is pretty hard to appreciate in the original skit itself because of the enormous roar of the laughing audience. If any criticism is to be directed at this collection, it's the lack of chapter stops within the episodes themselves, which is an annoyance. Mr. Show is a tremendously good comedy show in ways that are just simply hard to describe. So, instead, go out and see it. I think you'll be pleased. As for the already established fans: there's no reason not to own this newest collection. Now comes the long wait for Season Four (the final season), which will hopefully have the same nice extras and great commentary.